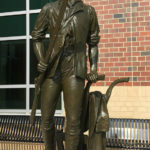 This 6′ version of the Concord Minuteman was beautifully sculpted by well know artist, Ed Walker. 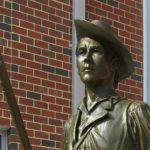 Based on the original version of the Minuteman located in Concord, Massachusetts by Daniel Chester French, Walker visited the original sculpture and museum to do research on both the sculpture and the artist. Working in the style of French, Walker first created a 2′ model which was enlarged and finished as a 6′ figure. 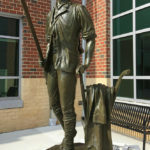 The figure is a minuteman, symbolically leaving his coat and plow behind to aid his compatriots in the first battle with the British at the start of the revolutionary war. 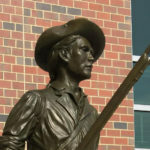 This figure includes a rifle modeled after a period flintlock musket and is engraved on the base with the the title, “Concord Minuteman”, signed by Ed Walker and including “after Daniel C. French” to give credit to the original artist. Each casting in the edition of 100 is signed by the artist and comes with a certificate of authenticity. 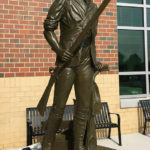 The #1/100 is located at the National Guard Headquarters Visitor Center in Richmond, VA.